AquaVantage is a digital, high powered electro-magnetic descaler. Consisting of a three pin electric plug source, a control box, two wires wound around the water pipe in two separate coils. The digital and radio waves convert hard scale into soft aragonite crystals that help to remove existing scale. The AquaVantage is used on incoming water mains, PoolVantage is used on swimming pools or recirculation systems and DairyVantage is used on milk lines to prevent the build up of fats and proteins. Savings of 25-50% can be achieved on reducing chemical cleaner/ disinfectants using these systems. Applications: Whole House or premises treatment.Swimming pools. Commercial / Industrial applications:Descaling Cooling Towers, heat exchangers and recirculation systems.Chemical reduction projects are able to meet sustainable targets as the water will be ‘Wetter’. No Mechanism, No chemical consumables, Nor maintenance with a lifetime of service. Recommended by McDonalds Restaurants for all their new build franchise outlets in hard water areas. 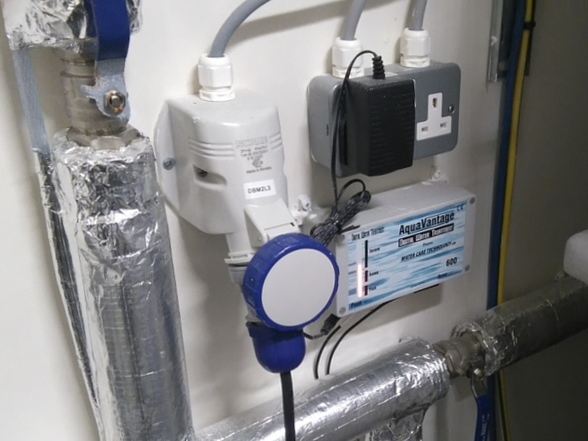 Portsmouth Borough Council’s swimming pool at WaterlooVille has ordered a PoolVantage after a two month trial revealed an annual saving on chemicals and operations of £ 4,000.00. Observations was improved water clarity and more stable pH.